Arthur Mayfield was born in 1880 in Nottingham the son of Edwin and Sarah Mayfield. His parents worked in the knitwear industry. Edwin was a framework knitter and Sarah a hosiery hand. In 1881 Arthur was living with his grandmother, his parents and his aunt lived in Clarence Street, Sneinton, Nottingham. Arthur’s grandmother Sarah Daykin was a dressmaker. Working from home she would have been available to look after Arthur and his two brothers and sister while their parents were at work. By 1891 Sarah and the children were living in Manvers Street with her mother Sarah Daykin who by then had become a tobacconist. Sarah Mayfield was still working as a hosiery hand. Arthur was at school as were his brothers George (9) and Ernest (4) and his sister Elizabeth (7). 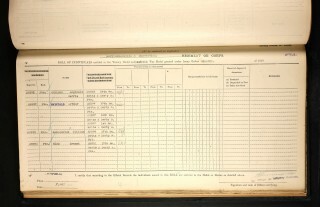 Edwin Mayfield was visiting his parents on the night of the 1891 census. 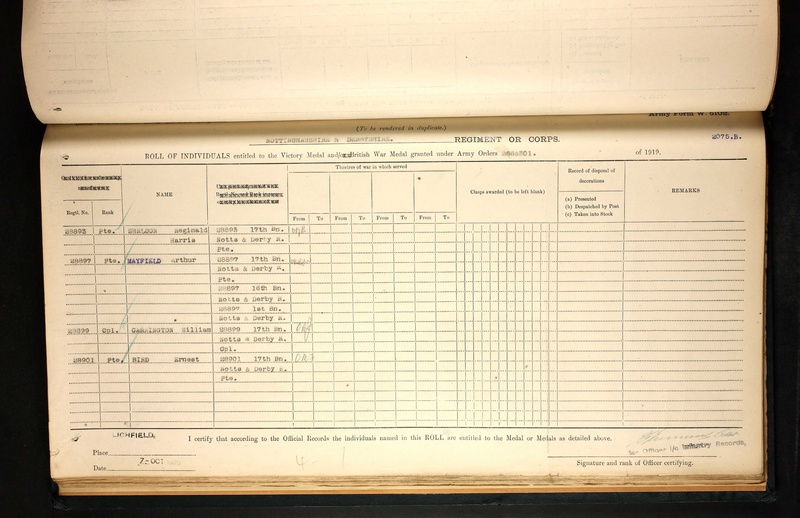 The 1901 Census records Arthur as living with his mother and Elizabeth and Ernest. Sarah continued to work as a hosiery hand. Arthur by then was employed as a hairdresser, his sister Elizabeth was a machinist and Ernest was an errand boy. Edwin was no longer living with his family in Bentinck Street, Nottingham. In 1911 he was registered as an inmate at the Union Workhouse, Bulwell. Also by 1911 Arthur Mayfield had moved to Bottesford, probably in about 1903. Aged 31 he was now married to Ada Mayfield (nee Stevens) and living on Grantham Road, quite close to The Cross. The family rented a house and shop that belonged to Thomas Kennington where Arthur worked as a hairdresser. He also sold cigars and cigarettes as had his Grandmother. Ada and Arthur had 2 sons (Arthur aged 8 and Cecil aged 3) and a daughter (Edna aged 11 months). In 1915 they had another son, Leslie. 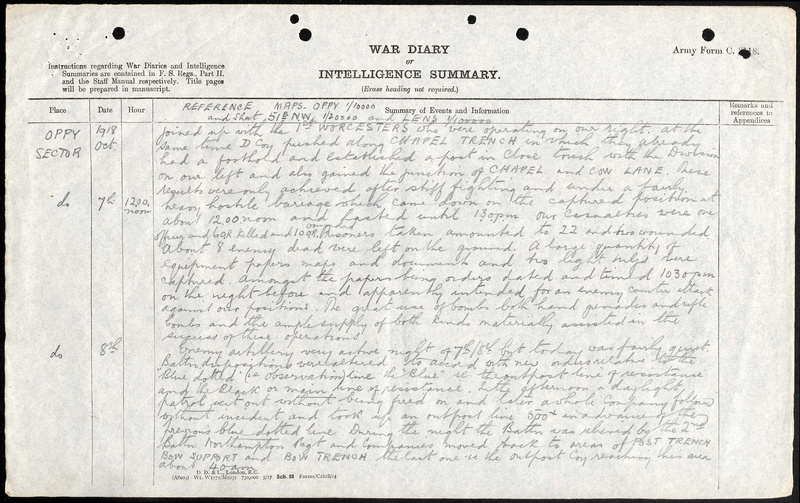 Arthur Mayfield enlisted and was a private in the 17th Battalion Notts. and Derby (Sherwood Foresters) Regiment (service number 28897). No detailed records of his war service survive. 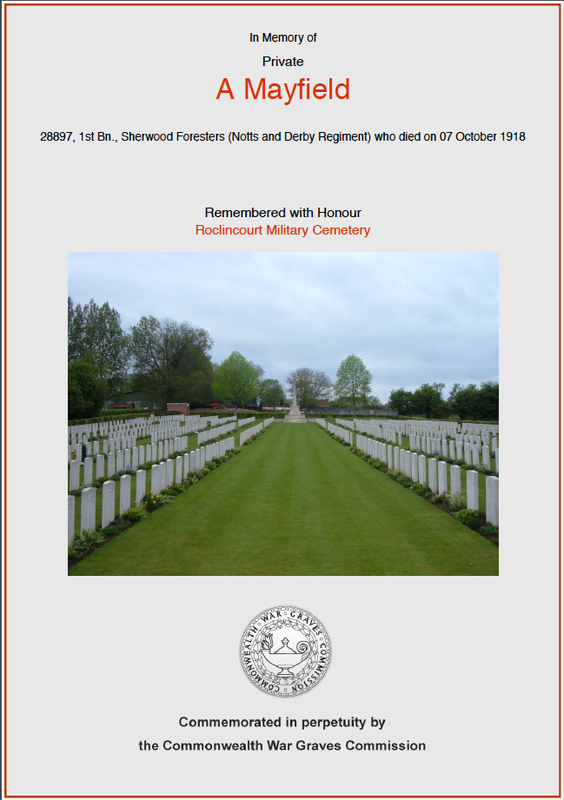 However, the Medal Roll for the Sherwood Foresters also lists a William Carrington whose service number was 28899. 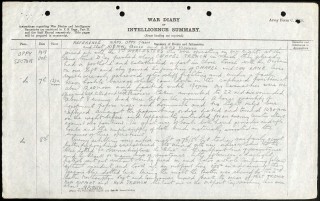 William Carrington was killed in action on the 3rd September 1916. 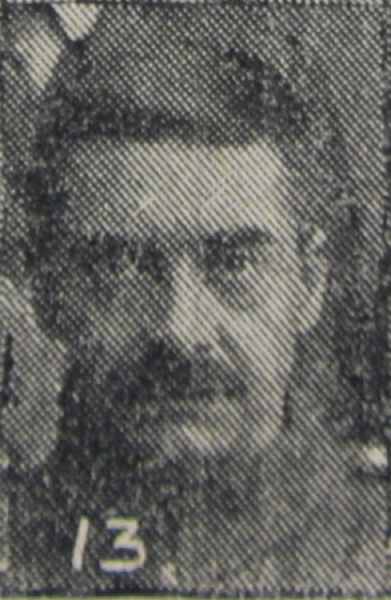 Arthur Mayfield’s number therefore indicates that he enlisted around the same date as William Carrington given the closeness of their service numbers and at least before September 1916. The medal roll also shows that he initially served with the 17th Battalion the Sherwood Foresters and subsequently with the 16th Battalion. 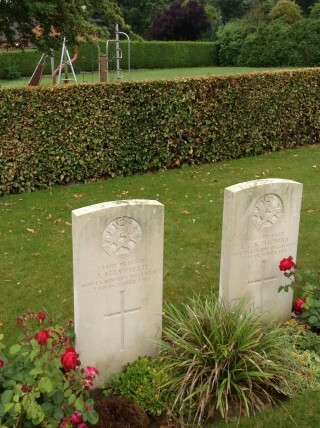 These two battalions were amalgamated in the spring of 1918 into a composite battalion as part of an army wide re-organisation of brigades from four to three battalions. Both battalions had suffered heavy losses during the German Spring Offensive of 1918. This new composite battalion became a training cadre soon after. Sadly Arthur does not appear to have remained with them as he is finally listed as serving with the 1st Battalion Sherwood Foresters. As a front line unit this battalion was in continual need of reinforcements as it advanced during the last ‘100 days’ of the war. Arthur, at some point after the spring of 1918, must have been transferred into the 1st Battalion. Arthur Mayfield was one of those six men killed in that action. Father of four young children, he lies next to the children’s playground on the left hand side boundary of the Roclincourt Military Cemetery, Pas de Calais, France.